All 1968 428 CJ powered vehicles built after the start of regular production on approximately April 15, 1968 were equipped with a starter delay relay. 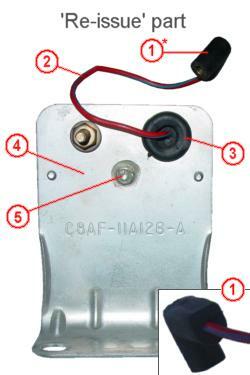 The part number for the relay is C8AZ-11A126-A. The purpose of this solid state relay was to prevent re-engagement of the starter within 4 seconds of any failed attempt to start the engine. The intent was to prevent damage to the starter drive and the flywheel/flexplate by allowing the engine to come to a complete stop before the starter could be used again. 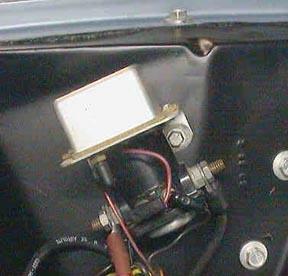 The starter delay relay is mounted between the starter relay and the engine compartment wall using the standard starter relay screws. 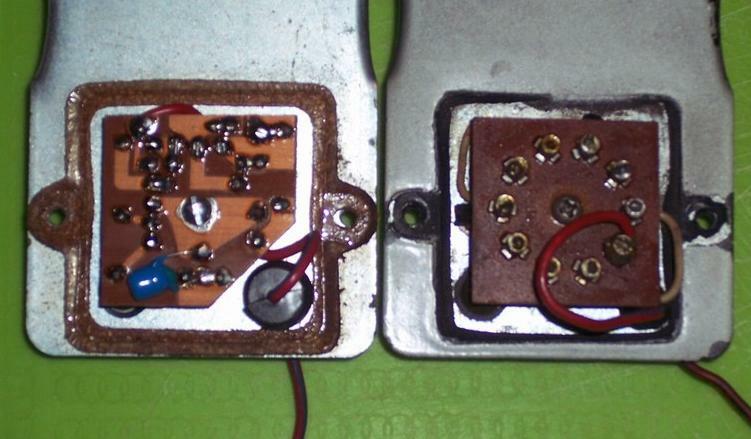 The pictures below show the relay in its installed position. There are some obvious external differences between the original and the later part. One discernible difference is that the original unit used a black foam gasket between the mounting plate and the relay cover. 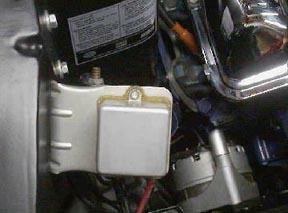 The later unit used a cork gasket to seal the relay cover. The differences between the gaskets used on each of the units can be seen by comparing the original shown below (right) and the gasket on the installed unit shown above. 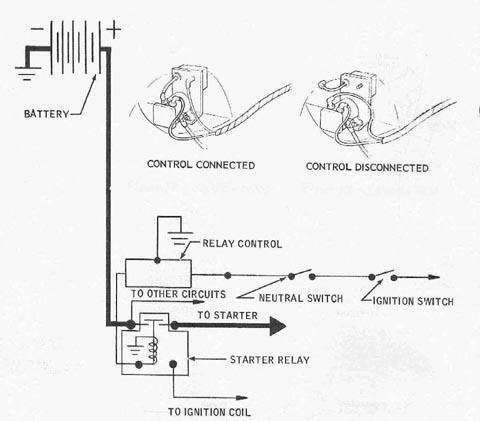 The starter delay relay is operating correctly if the starter motor engages immediately when the key is first turned to the "start" position and then cannot be re-energized until approximately four seconds have elapsed. 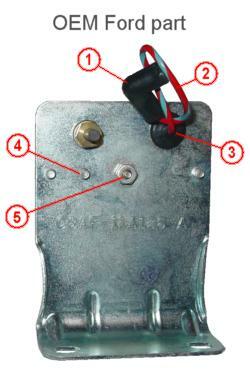 The starter delay relay assembly is a solid state device and is not adjustable or reparable. "Sometime around 1990, several well-known Ford parts vendors purchased what each separately thought was a small cache of NOS starter delays. In fact, what they had really bought were reproduction units and an imaginative story. Each vendor was told he would get first shot at a trove of "old engineering samples", recently found at the Rouge facility in Dearborn. The deal was simple: buy one for a good price or buy "all twelve" for under $100 each. Thinking he was the only buyer, each vendor leapt at this chance to corner the market on a rare part. And it seems no one was too worried that these parts looked pristinely brand-new and arrived neatly packed in zip-bags. But inked markings are easily added and their absence is easily explained. It's also easy enough to cut a foam gasket to replace the cork one found on a "repro". So, here are the features you should focus on. Refer to this key when examining the photos above. OEM wire has clear, "spiral" stripes. "Repro" is more a lengthwise design. "Repro" grommet is nearly twice the diameter of the OEM part. Missing screw on "repro" that's used to hold OEM circuit board. "Repro" has this odd attachment that appears to be epoxied in place. Metal plating is slightly different. ** It is interesting to note that, many (perhaps most) of the repros had ink-stamps at one time. Those I have seen bore an incorrect ID stamping of "C8AZ-11A126-A"... the service part number, rather than the "C8AF-11A126-A" engineering number stamped on a genuine Ford relay. The "repro" stamp is also different in that it was made with Violet-tinged ink rather than Dark Blue."